A traditional cache placed close to the church of St Mary in Sheviock. 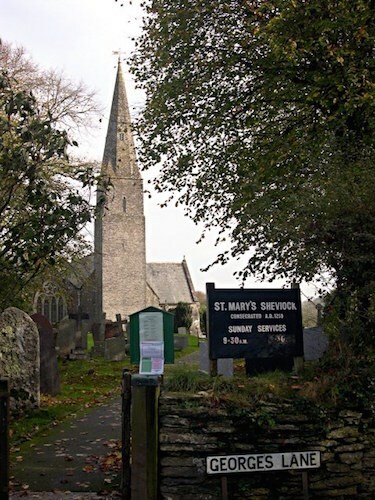 St Mary’s is part of a cluster of churches that serve the parishes of Torpoint, Antony and Sheviock. Bishop Bronescombe of Exeter consecrated the building on Monday 13 October in the year 1259 during a tour of Cornwall in which he consecrated twenty churches. However, the parish is much older than the present building and was mentioned in the Doomsday Book and a previous building mentioned in a Papal Bull dated 1193. The original building consisted of Tower with spire, the Nave and the Chancel. Between 1350 and 1370 the Lady Emmeline Dawney, with her husband Sir Edward Courtney did some building in the locality including the church where two transepts were added – turning the church into a cruciform shape. The effigies of Lady Emmeline and Sir Edward are to be found in the South transept known as the Dawney aisle. If you look at the effigies you can see examples of ancient graffiti carved into them!! Also look at the holes behind the North door, designed to hold a timber cross bar to prevent access. About 1430 the North aisle was added and the church paved with slate and seats provided only for the infirm and elderly against the walls. There is room for one car at the cache coordinates but additional roadside parking can be found across the A374 in Horsepool Road. The Church car Park, which is signposted, is only open when church services are due to be held. The cache is a camo'd tube about 10 cms long and 3 cms in diameter and is magnetically attached.